TheCarMagazine.com (TCM for short) is a user-friendly online portal with a mandate to be Canada’s premier source for new car vehicle information. Debuting in May of 2002 and designed exclusively for the digital environment, TCM features an extensive library of new vehicle reviews, spectacular image galleries, and a wealth of CarCostCanada.com-powered new vehicle pricing data. Potential vehicle buyers can browse through detailed reviews of new cars & trucks manufactured for sale in Canada – not only for the current model year but for previous years as well. TCM is a virtual fountainhead of informative automotive data ranging from discounts to buyer reviews and much, much more. 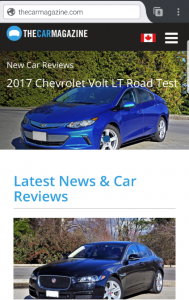 The continually updated website boasts extensive new car research features geared to assist new vehicle buyers in navigating the everchanging automotive marketplace. This recent comprehensive refresh builds on years of constructive feedback by site users, resulting in a wealth of helpful features while further refining the “just one click” user experience. As Canada’s most comprehensive new vehicle buyers guide, TheCarMagazine.com addresses these issues head-on. Throughout its existence, TCM has highlighted the many disparities between US-built and Canadian-built vehicles. TCM’s paramount objective has been and continues to be empowering Canadian new vehicle buyers with accurate, up-to-date data and information about Canadian-specification vehicles – the vehicles they’ll actually be buying. This focus on domestic market vehicles makes TheCarMagazine.com the obvious choice when it comes to researching new cars in Canada. TheCarMagazine.com enjoys a mutually-beneficial association with LeaseBusters.com, Canada’s leading lease take-over destination, and FinanceBusters.com, your one-stop-shop for IPO Integrity Pre-Owned Vehicles. By virtue of its comprehensive domestic-oriented database, TCM has become the premier automotive research site for LeaseBusters and FinanceBusters members. It’s a match made in car-owning heaven, since many customers will buy or lease a new vehicle after liberating themselves from their current obligations via LeaseBusters and FinanceBusters. Armada Data hits the ground running in 2017 by virtue of being debt-free after repaying a corporate loan in full. “I am pleased that the Company’s performance has allowed repayment of these Notes Payable,” states Controller and CFO Elizabeth Matthews, “and I’m glad our cash position has recovered enough to pay them out.” Matthews also states she is thankful to the related party company for providing loans that enabled the company’s recovery. Additional information relating to Armada Data Corporation is filed on SEDAR, and can be viewed at www.sedar.com.